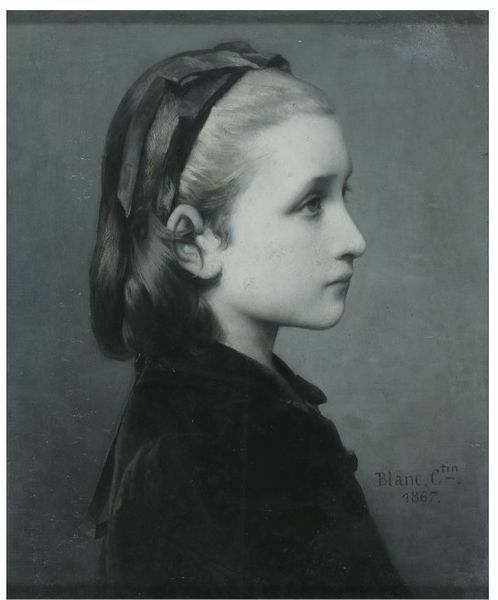 Célestin Joseph Blanc (1818-1888) was a pupil of the history painter Paul Delaroche (1797-1856) and the Swiss artist Charles Gleyre (1806-1874) in Paris. He mainly produced religious and mythological paintings but also portraits. He regularly exhibited at the Salon in Paris from 1844 to 1882. This painting is a fine example of mid-19th century portrait for its realist approach however the choice of representing the sitter in profile is rather unusual. It combines child portraiture with a touch of austerity enhanced by the black dress. This may result from an imitation of the first portraits which were engraved on coins and medals and had a mere commemorative function. The grisaille technique resemble a photograph which would eventually supplant portrait paintings in the following 20th century. 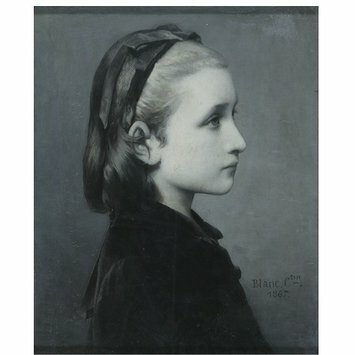 An oil portrait of a young girl in profile against a grey background; her fair hair is held back with a black ribbon. Historical significance: This painting is a fine example of mid-19th century portraiture grounded in a close observation of nature. 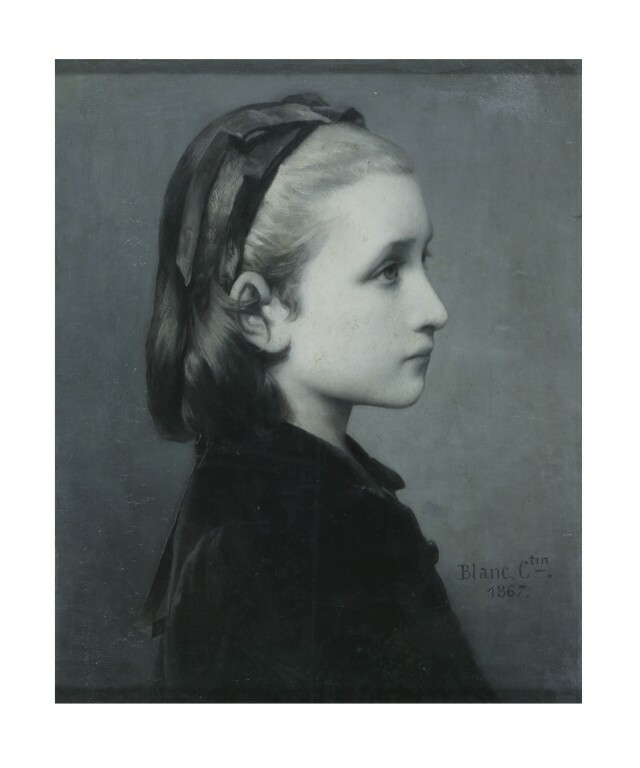 This realist portrait shows a young girl in profile dressed in black while her face is subtly modelled by a diffuse light. Profile portraits go back to the origins of portraiture when the profile of the sitter was engraved on coins and had mostly a commemorative function. This may be the case here as the young girl in dressed in black and shows a somehow morning face. It is not unlikely that this portrait was a posthumous portrait. The grisaille technique tends here to resemble photography which would eventually supplant portrait paintings. Kauffmann, C.M., Catalogue of Foreign Paintings, II. 1800-1900, London: Victoria and Albert Museum, 1973, p. 6, cat. no. 14. Morris, E., 'Philip Henry Rathbone and the purchase of contemporary foreign paintings for the Walker Art Gallery, Liverpool, 1871-1914' in Annual Report and Bulletin of the Walker Art Gallery Liverpool, 1975-76, vol IV, p.59.